Have you seen a bat? We’re always looking for records of bats in Devon. You can let us know about a sighting by filling in this reporting form. If you know more about bats or have seen lots of them, you could fill in this record sheet instead. You can post them to the address on the form, or email them to devonbatgrouprecords@gmail.com. However if the bat you found is injured or on the ground, please read on! Bats are protected by law but that does not stop you from helping an injured bat. If you find a bat that is out in the day, is grounded or injured in any way then it needs immediate help. Please don’t assume that the bat will be ok and fly away later. 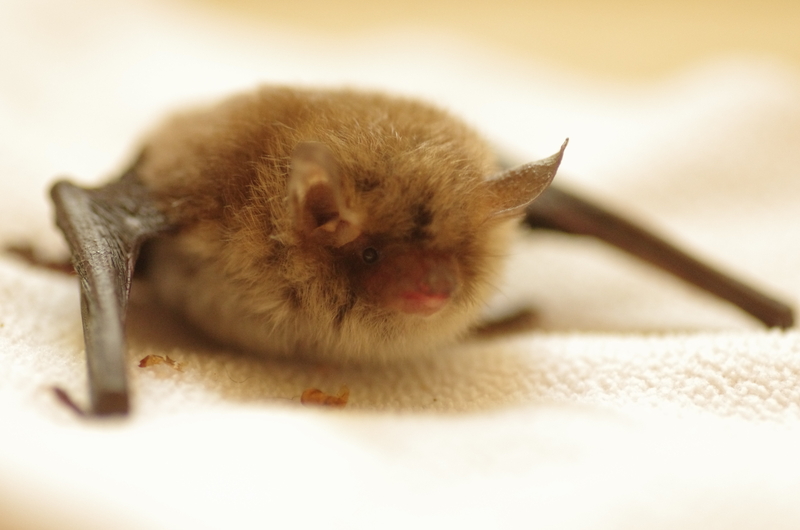 A natterer’s bat in care. 1) Use a cloth or teatowel and gently scoop the bat up, Pick it up in a gloved hand, or cover it with a box and slide a piece of card underneath it. 3) Put a cloth and a small bottle top containing water into the box (somewhere for the bat to hide in and something for it to drink). This will need to be kept topped up. 4) Leave the box in a cool and quiet place, and call either the Bat Conservation Trust helpline on 0345 1300 228, or the local helplines on (South Devon) 01803 214665 and (North Devon) 01409 281178, or . They will give you advice or arrange for someone to come and assess/collect it. More useful information can be found on BCT’s website.